It was 2800 BC. Chinese princess Si ling-ti had already made her greatest discovery — silk! For this breakthrough, she was treated as Goddess of Silk, and altars were built in her name! Industrious Chinese exploited her invention not only as a new means of employment but also as the most valuable commodity in the world trade. Caravans all over the world were exchanged for this precious material. The world went crazy about this Queen of Textiles. It was bartered for gold! In a nutshell, it greatly influenced the economy of China and made her prosperous. And not surprisingly, this art of making silk was guarded as a top-most secret for more than 3,000 years. Anyone who tried to reveal this secret was tortured to death. By the period of Han Dynasty (founded in 200 AD), China had established a flourishing silk trade with the Western countries. The countless caravans had made their route, popularly known as Silk Route, across Asia, bringing silk from China to Damascus, the then world market centre. From there, it was taken to Rome and further. The Silk Route or Road is one of the most evocative of names that conjures the very sight of camels carrying bales of luxurious goods — brocades, colourful diaphanous silks, and spices! James Elroy Flecker, in his poem The Golden Journey to Samarkand, expresses picturesque views of caravans trekking across the deserts surrounded by snow-capped mountains, oasis towns with bustling markets thronged with inhabitants, and exotic travellers buying and selling valuable commodities. But Flicker’s poetic expression is only a tip of the ice berg. The silk route in reality was hazardous, especially for traders. With biting winters, burning summers, brutal attacks by robbers/bandits, rationed food and dirty drinking water, miles of barren lands, sandy hurricanes, sand dunes, mountain barriers, sleepless nights, haunting hallucinations, home sickness, and insecurity compounded with many a phobia, this route was a nightmare. Starting from Xian of Shaanxi province, it traversed through a series of mountains and deserts; Central Asia to Tyre; to Europe and Egypt, and further to port cities by sea. From Mediterranean, it spread to Spain, Latin America and North America. California seems to be the end point of this famous route. It almost stretched round the globe. The name Seidenstrasse or Silk Route was coined by a German explorer and geographer Baron Ferdinand von Richthofen in 1077. In reality, it was knitted with many a complex tracks. 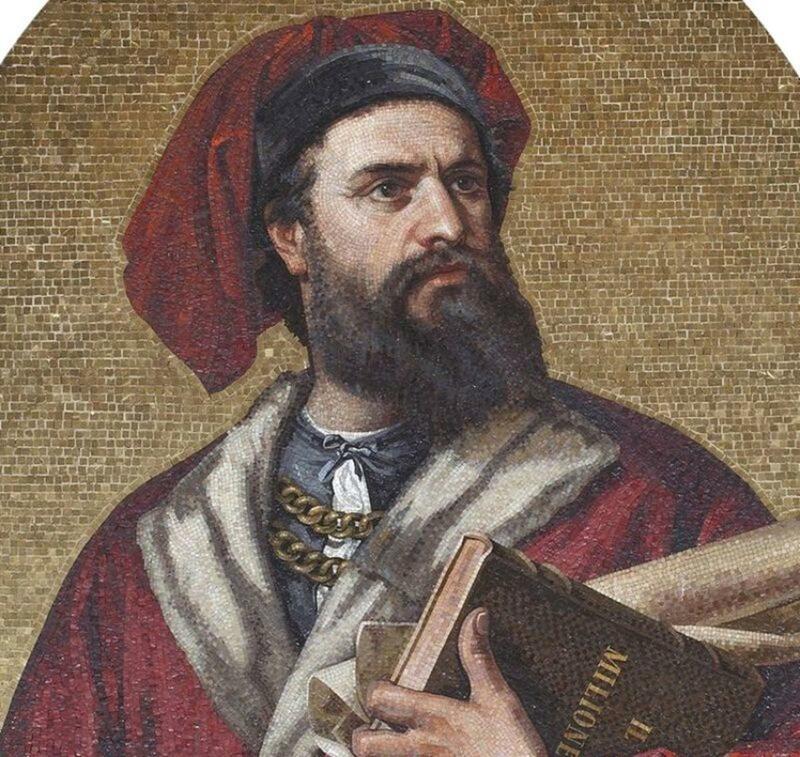 The romance of the Silk Route could be traced back to the medieval accounts of travellers like Marco Polo (1256-1323). Except for a few adventurous people like him, no one had travelled along this route. 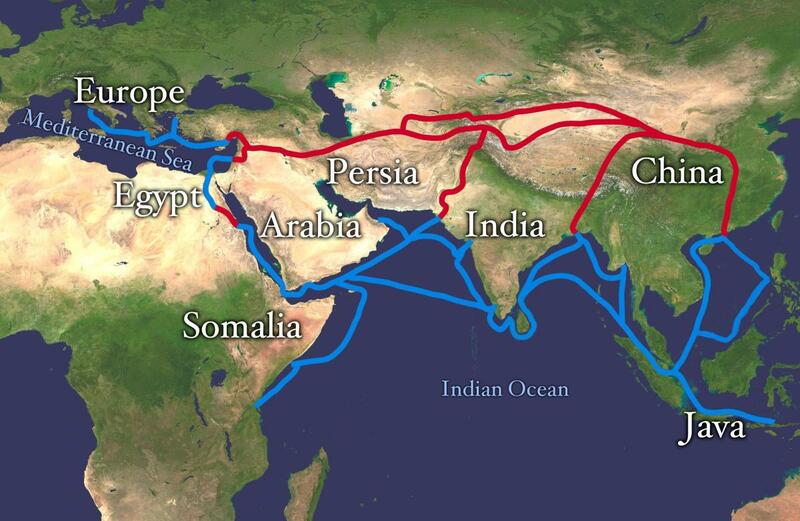 The Silk Route was an all-purpose trade route going west from the Orient and to east by the Middle East. Commodities like amber, rugs, glass, spices, cobalt, tea, jade and silks were carried along this route. It was named Silk Route because silk was the most expensive and valuable commodity then. These silk commodities/loads were exchanged at a number of places. With each exchange, the silk price shot up. It was a Midas touch. Silk made everyone prosperous. Be it a producer or a trader. For more than two millennia, not only luxury goods but even religions, cultures, traditions also moved along the routes. While China was the source of silk, Damascus turned into a world silk market where East and West exchanged their goods. Persians took the lead of bringing silk from China. And naturally, they rose to a commanding position in this trade and controlled all the silk that came from China. They exploited people’s craze for silk by converting it into gold coins. The legendary fabric was sold by them at such fabulous prices that the price turned into a legend! But who was the sufferer? Ultimately, it was the Romans. They had to pay through their nose. Roman emperor Justinian had to file objections for paying such exorbitant prices to Persians, but in vain. During the 6th century, the determined emperor even tried to find out a new trade route to China via Constantinople, keeping away Persia. For different reasons it was not successful. But he did not lose heart. He sent two Nestorian monks to China (who had earlier lived there) to ‘smuggle’ the secret of silk-making. These clever monks brought back this silk secret to Constantinople by risking their life. Along with this secret, these monks also brought back some mulberry seeds and silkworm eggs hidden in the hollow clubs. This industrial espionage ended the monopoly of both China and Persia as producer and trader of silk respectively, alas! During the next few centuries, people from various countries learnt the art of silk-making. Italy turned into an epicentre of Western silk market by 1200. The enterprising French took up silk-weaving during 1500. The first silk-weaving factory was built at Mansfield in England, in 1810. It is said that during 400 AD, a Chinese princess who married an Indian prince brought with her some seeds of mulberry and silkworm eggs by hiding them in the lining of her headgear. Sericulture was first established in the tract, which lies between Rivers Ganges and Brahmaputra. Though there is no recorded document available regarding the origin of silk in India prior to 400 AD, one can find the mention of silk in Indian epics like the Ramayana and the Mahabharata. In case of Japan, it was a different story. If others smuggled the secret of silk to their countries, four Chinese concubines were brought to Japan to teach them the making of woven silk. Today, silk and silk-making are no more a secret! It is practised in dozens of countries the world over. Whatsoever it may be, the world should remain grateful to those two anonymous monks who came, saw, and conquered the secret of making silk — Veni, Vidi, Vici. However, China’s loss of silk secret was a gain to other countries.